Science studies is an interdisciplinary research area that seeks to situate scientific expertise in broad social, historical, and philosophical contexts. It uses various methods to analyze the production, representation and reception of scientific knowledge and its epistemic and semiotic role. Similarly to cultural studies, science studies are defined by the subject of their research and encompass a large range of different theoretical and methodological perspectives and practices. The interdisciplinary approach may include and borrow methods from the humanities, natural and formal sciences, from scientometrics to ethnomethodology or cognitive science. Science studies have a certain importance for evaluation and science policy. Overlapping with the field of science, technology and society, practitioners study the relationship between science and technology, and the interaction of expert and lay knowledge in the public realm. The field started with a tendency toward navel-gazing: it was extremely self-conscious in its genesis and applications. From early concerns with scientific discourse, practitioners soon started to deal with the relation of scientific expertise to politics and lay people. Practical examples include bioethics, bovine spongiform encephalopathy (BSE), pollution, global warming, biomedical sciences, physical sciences, natural hazard predictions, the (alleged) impact of the Chernobyl disaster in the UK, generation and review of science policy and risk governance and its historical and geographic contexts. While staying a discipline with multiple metanarratives, the fundamental concern is about the role of the perceived expert in providing governments and local authorities with information from which they can make decisions. The approach poses various important questions about what makes an expert and how experts and their authority are to be distinguished from the lay population and interacts with the values and policy making process in liberal democratic societies. aesthetics of science and visual culture in science (u.a. Peter Geimer), the role of aesthetic criteria in scientific practice (compare mathematical beauty) and the relation between emotion, cognition and rationality in the development of science. semiotic studies of creative processes, as in the discovery, conceptualization, and realization of new ideas. or the interaction and management of different forms of knowledge in cooperative research. research ethics, science policy, and the role of the university. Maria Ossowska and Stanislaw Ossowski started to introduce the concept in the 1930s. Thomas Kuhn's Structure of Scientific Revolutions (1962) led to an increased interest in not only the history of science, but also its philosophical underpinnings. Kuhn's work established that the history of science was less a linear succession of discoveries, but rather the concept of paradigms to the philosophy of science. Paradigms are broader, socio-intellectual constructs that determine which types of truth claims are permissible. Science studies try to identify crucial dichotomies as in science and technology, nature and culture, theories and experiments; science and fine art leading to the separation of various science fields and practices. Sociology of scientific knowledge developed at the University of Edinburgh, where David Bloor and his colleagues developed what has been termed the 'strong programme'. The strong programme proposed that both 'true' and 'false' scientific theories should be treated the same way. Both are caused by social factors or conditions, such as cultural context and self-interest. All human knowledge, as something that exists in the human cognition, must contain some social components in its formation process. It proved however difficult to address natural science topics with sociologist methods, as proven by the US science wars. The use of a deconstructive approach (as for works on arts or religion) on natural sciences risked to endanger not only the "hard facts" of natural sciences, but as well the objectivity and positivist tradition of sociology itself. The view on scientific knowledge production as a (at least partial) social construct was not easily accepted. Latour and others identified a dichotomy crucial for modernity, the division between nature (things, objects) as being transcendent, allowing to detect them, and society (the subject, the state) as immanent as being artificial, constructed. The dichotomy allowed for a mass production of things (technical-natural hybrids) and large scale global issues that in the meanwhile threaten endangered the distinction as such. E.g. We Have Never Been Modern asks to reconnect the social and natural worlds returning to the premodern use of "thing"—addressing objects as hybrids made and scrutinized by the public interaction of people, things and concepts. Science studies scholars such as Trevor Pinch and Steve Woolgar started already in the 1980s to involve "technology", and called their field "science, technology and society". This "turn to technology" brought science studies into communication with academics in science, technology, and society programs. More recently, a novel approach known as mapping controversies has been gaining momentum among science studies practitioners, and was introduced as a course for students in engineering, and architecture schools. in 2002 Harry Collins and Robert Evans asked for a third wave of science studies (a pun on The Third Wave), namely studies of expertise and experience answering to recent tendencies to dissolve the boundary between experts and the public. A showcase of the rather complex problems of scientific information and its interaction with lay persons is Brian Wynne's study of Sheepfarming in Cumbria after the Chernobyl disaster. He elaborated on the responses of sheep farmers in Cumbria, who had been subjected to administrative restrictions because of radioactive contamination, allegedly caused by the nuclear accident at Chernobyl in 1986. The sheep farmers suffered economic losses and their resistance against the regulation imposed was being deemed irrational and not adequate. It turned out that the source of radioactivity was actually the Sellafield nuclear reprocessing complex; thus, the experts who were responsible for the duration of the restrictions were completely mistaken. The example lead to various attempts to better involve local knowledge and experience of lay people and to assess its often highly geographically and historically defined background. Donovan et al. (2012) used and described the STS respectively science studies for social studies of volcanology and the generation of knowledge and expert advice on various active volcanoes. It contains a survey of volcanologists carried out during 2008 and 2009 and interviews with scientists in the UK, Montserrat, Italy and Iceland during fieldwork seasons. Donovan et al. (2012) asked the experts about the felt purpose of volcanology and what they considered the most important eruptions in historical time. The survey tries to identify eruptions that had an influence on volcanology as a science and to assess the role of scientists in policymaking. 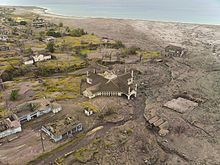 A main focus was on the impact of the Montserrat eruption 1997. The eruption, a classical example of the black swan theory directly killed (only) 19 persons. However the outbreak had major impacts on the local society and destroyed important infractructure, as the island's airport. About 7,000 people, or two-thirds of the population, left Montserrat; 4,000 to the United Kingdom. The Montserrat case put immense pressure on volcanologists, as their expertise suddenly became the primary driver of various public policy approaches. The STS approach provided valuable insights in that situation. There were various miscommunications among scientists. Matching scientific uncertainty (typical of volcanic unrest) and the request for a single unified voice for political advice was a challenge. The Montserrat Volcanologists began to use statistical elicitation models to estimate the probabilities of particular events, a rather subjective method, but allowing to synthesizing consensus and experience-based expertise step by step. It involved as well local knowledge and experience. Volcanology as a science currently faces a shift of its epistemological foundations of volcanology. The science started to involve more research into risk assessment and risk management. It requires new, integrated methodologies for knowledge collection that transcend scientific disciplinary boundaries but combine qualitative and quantitative outcomes in a structured whole. Science has become a major force in Western democratic societies, which depend on innovation and technology (compare Risk society) to address its risks. Beliefs about science can be very different from those of the scientists themselves, for reasons of e.g. moral values, epistemology or political motivations.The designation of expertise as authoritative in the interaction with lay people and decision makers of all kind is nevertheless challenged in contemporary risk societies, as suggested by scholars who follow Ulrich Beck's theorisation. The role of expertise in contemporary democracies is an important theme for debate among science studies scholars. Some argue for a more widely distributed, pluralist understanding of expertise (Sheila Jasanoff and Brian Wynne, for example), while others argue for a more nuanced understanding of the idea of expertise and its social functions (Collins and Evans, for example). ^ Traweek, Sharon (1992). Beamtimes and lifetimes: the world of high energy physicists. Cambridge, Massachusetts: Harvard University Press. ISBN 9780674044449. ^ Derek de Solla Price: Little Science, Big Science. Von der Studierstube zur Großforschung. Suhrkamp, 1982, ISBN 978-3518076484. ^ Matthias Kölbel: Wissensmanagement in der Wissenschaft, Berlin: Gesellschaft für Wissenschaftsforschung e.V. c/o Inst. f. Bibliotheks- und Informationswissenschaft der Humboldt-Universität zu Berlin, 2002, elektronische Bereitstellung 2011. ^ David Bloor, "The strengths of the strong programme." Scientific rationality: The sociological turn (Springer Netherlands, 1984) pp. 75-94. ^ a b Latour, Bruno (March 2000). "When things strike back: a possible contribution of 'science studies' to the social sciences". British Journal of Sociology. 51 (1): 107–123. doi:10.1111/j.1468-4446.2000.00107.x. ^ Lash, Scott (1999). Objects that judge: Latour's parliament of things, in another modernity, a different rationality. Oxford: Blackwell. ISBN 9780631164999. ^ An Introduction to Science and Technology Studies Sergio Sismondo John Wiley & Sons, 17.08.2011. ^ a b c d Wynne B (1989) Sheepfarming after Chernobyl: a case study in communicating scientific information. Environment 31(2):33–39. ^ Lash, Scott; Szerszynski, Bronislaw; Wynne, Brian (1996). Risk, environment and modernity: towards a new ecology. Theory, culture & society. London: Sage Publications. doi:10.4135/9781446221983. ISBN 978-0803979376. ^ Donovan et al. (2012) cite Taleb NN (2007) The black swan: the impact of the highly improbable. Allen Lane, London. ^ "BBC country profile: Montserrat". BBC News. 22 September 2009. Retrieved 2008-03-08. ^ "Montserrat evacuation remembered". BBC. 12 September 2005. Retrieved 19 November 2010. ^ Collins, Harry; Evans, Robert (2007). Rethinking Expertise. University of Chicago Press. ISBN 978-0226113623. ^ Collins, Harry (2004). "Interactional expertise as a third kind of knowledge". Phenomenology and the Cognitive Sciences. 3 (2): 125–143. doi:10.1023/B:PHEN.0000040824.89221.1a. ISSN 1568-7759. Bauchspies, W., Jennifer Croissant and Sal Restivo: Science, Technology, and Society: A Sociological Perspective (Oxford: Blackwell, 2005). Biagioli, Mario, ed. The Science Studies Reader (New York: Routledge, 1999). Bloor, David; Barnes, Barry & Henry, John, Scientific knowledge: a sociological analysis (Chicago: University Press, 1996). Gross, Alan. Starring the Text: The Place of Rhetoric in Science Studies. Carbondale: SIU Press, 2006. Fuller, Steve, The Philosophy of Science and Technology Studies (New York: Routledge, 2006). Hess, David J. Science Studies: An Advanced Introduction (New York: NYU Press, 1997). Jasanoff, Sheila, ed. Handbook of science and technology studies (Thousand Oaks, Calif.: Sage Publications, 1995). Latour, Bruno, "The Last Critique," Harper's Magazine (April 2004): 15-20. Latour, Bruno. Science in Action. Cambridge. 1987. Vinck, Dominique. The Sociology of Scientific Work. The Fundamental Relationship between Science and Society (Cheltenham: Edward Elgar, 2010). Foucault, Michel, "Truth and Power," in Power/Knowledge (New York: Pantheon Books, 1997), 109-133. Porter, Theodore M. Trust in Numbers: The Pursuit of Objectivity in Science and Public Life (Princeton: Princeton University Press, 1995). Restivo, Sal: "Science, Society, and Values: Toward a Sociology of Objectivity" (Lehigh PA: Lehigh University Press, 1994). Dumit, Joseph (2003). Picturing Personhood: Brain Scans and Biomedical Identity. Princeton: Princeton University Press. Fadiman, Anne (1997). The Spirit Catches You and You Fall Down. New York: Farrar, Straus and Giroux. Martin, Emily (1999). "Toward an Anthropology of Immunology: The Body as Nation State". In Biagioli, Mario. The Science Studies Reader. New York: Routledge. pp. 358–71. Mitchell, William J. Rethinking Media Change Thorburn and Jennings eds. Cambridge, Massachusetts : MIT Press, 2003. Rheingold, Howard. Smart Mobs: The Next Social Revolution. Cambridge: Mass., Perseus Publishing. 2002. Wikimedia Commons has media related to Science studies.